This original and sharply obser-vant book gives new significance to three important figures in the history of twentieth-century art: Eva Hesse, Lee Krasner, and Georgia O'Keeffe. Anne Wagner looks at their imagery and careers, relating their work to three decisive moments in the history of American modernism: the avant-garde of the 1920s, the New York School of the 1940s and 1950s, and the modernist redefinition undertaken in the 1960s. Their artistic contributions were invaluable, Wagner demonstrates, as well as hard-won. 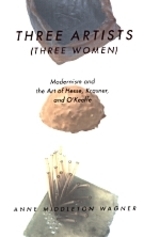 She also shows that the fact that these artists were women—the main element linking the three—is as much the index of difference among their art and experience as it is a passkey to what they share. Anne Middleton Wagner is Professor of the History of Art, University of California, Berkeley. She is the author of Jean-Baptiste Carpeaux: Sculptor of the Second Empire (1990).